Note: This is Part 3 of a mini-series.To read Part 1, click here. To read Part 2, click here. When Busy-ness and overwhelm takes over it’s easy to forget how to think. We become driven by doing and we get hooked into trying to do everything! We also feel that we should be able to do everything! Focusing on doing rather than thinking stops us from asking ourselves why we are struggling or how we could do it differently. We dis-engage our logical thinking processes. Getting stuck in the Do-Do is often driven by one of our strongest and most hardwired emotions: fear. This is a key driver of living reactively. 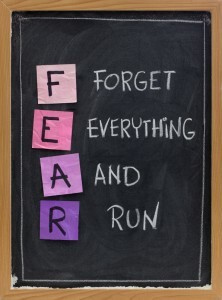 Fear overrides our thinking and our ability to be realistic about what we are able to achieve. Our emotions take over and run the show. Logical and rational thinking is replaced by chaos, desperation and overwhelm. There is a difference between just doing things (unconscious action) and taking conscious action. Conscious action is where are activities are defined, deliberate and purposeful. Actions are realistic and do-able. People are usually more frightened of blame and criticism than failure. The fear of criticism can be a powerful deterrent, and the criticism doesn’t have to happen for fear to set in. list the fears associated with YOUR busy-ness. what is the worst thing that could happen here? For example, in our working life it is easy to forget that we are paid to think as well as do. Why? Because doing is the tangible action stuff. Thinking can be seen as non-action and lazy. So it is seen as a nice thing to do, if I have the time! Thinking and planning a head is SO under-rated because of the illusion that in the time I have to think about it, I could have done it! It’s not perceived as productive. Instead we panic and the action we take is random, unplanned and unfocused. Here are four practical self-management tips. You already know these, BUT do you actually use them? Prioritize -This focuses on two elements: 1) relationships and 2) results. It helps you to stay On Purpose. What are the 1-2 important things that you need to focus your time on today? Small home runs will help you to experience how good it feels to complete something. This includes scheduling some time for me! See Circuit Breakers. Diaries and schedules – to plan in what I have to do and when I’m going to do it. This activity can stop procrastination by chunking down large overwhelming tasks into small do-able actions. Give each action a time e.g. 10am – 11 am. Show up at 10am, set a timer and just do it! Be imperfect - Flexibility is the key. Be prepared to re-prioritize and don’t expect perfection EVERY day. If you are a perfectionist, then these tools can restrict you because you can feel over-scheduled and rigid. You are not a robot! Priorities change so allow flexiability – it’s okay! How much time do you actually spend thinking, planning and writing down your activities before you do them? Value the importance of Thinking as well as Doing. Want some more techniques? Why not download my FREE GIFT on the right of this page:‘Are You In Busy-ness or Business? Four Ways to Get Your Life Back on Purpose.’ This download will really help you think and do!